"We didn't expect them to change such a fundamental behaviour," says Dr. Simon Clulow from Macquarie's Department of Biological Sciences. "Particularly given their nocturnal neighbours were only four to seven kilometres away." "This suggests that cane toads are particularly good at changing their behaviour in response to their environment, something known as behavioural plasticity, which might assist their invasive spread into new environments." 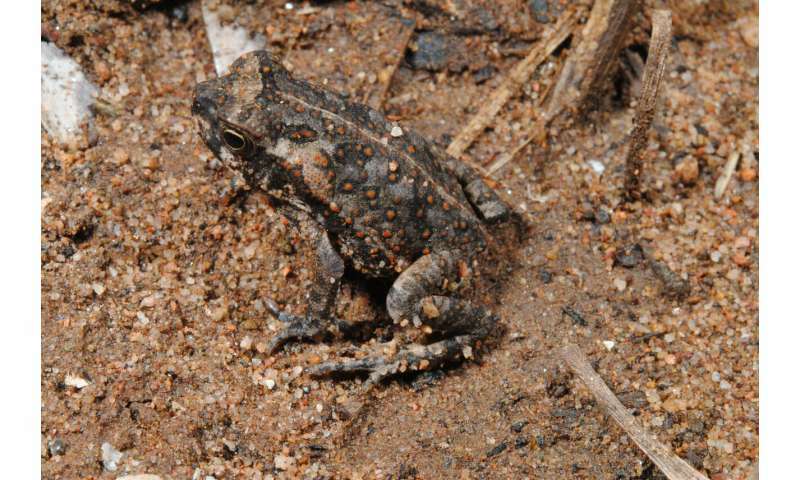 The research, which was published in Scientific Reports overnight, looked at cane toad populations near the invasion front in El Questro Wilderness Park in WA's Kimberley region from 2013 to 2015. It's research that has consequences for managing Australia's cane toad plague. "It is rare that an animal species changes activity times in such a short time period," says lead author Dr. Sean Doody from the University of South Florida St. Petersburg. "Our findings add to a growing list of flexible behaviours in the invasion arsenal of cane toads." It's thought cane toads are nocturnal in Australia to escape northern Australia's intolerably hot and dry conditions during the dry season. The researchers used remote cameras at eight different locations to monitor the toads' activity. They also dissected toads that were active during the day to see if this changed their eating habits. "We also found that toads that were active during the day were significantly more likely to flee from an observer than toads that were active at night," says Sean. "This increased wariness may have been due to them being at higher risk from predators at night, or being more conspicuous to predators during the day." The researchers weren't able to tell if the toads preferred being active during the day, or if this change was beneficial, but it's an intriguing question for further research. However, the toads' ability to change their behaviour in response to their environment, as this study reveals, is more bad news for managers attempting to control cane toads. "Such behavioural plasticity can help invasive species successfully invade new areas," says Simon. "And does help explain why cane toads have been able to colonise so much of northern Australia since their introduction in 1935." "Given the serious problems they cause, we need to better understand how behaviour contributes to the competitive ability and spread of cane toads, and other invasive animals."